BEXCO effect for Asia Film Market? Asian Film Market 2011 showed distinct growth this year with its relocation to BEXCO. Opening on October 10, the number of participants increased 39% from last year and the number of sales booths jumped 67%. As of the second day, there were 1,100 registrants, up from 789 the year before. “This year, the number of market screenings increased from 47 to 64, with 60 films on show up from 39 in six theaters as opposed to four,” said Art Film Market organizers. Hot new events in the programme this year were the APN Round Table, the Korea Contents Fund Showcase and Talent Meeting in Busan. Participating in the APN Round Table on the 11th were Lee Sangyong, Head of International Film Financing & Production at CJ E&M, and Peter Loehr, Managing Director of the Chinese arm of CAA, one of the biggest talent agencies in Hollywood. At the Korea Contents Fund Showcase, the nation’s leading investment funds gave a lively briefing. Representatives from SM, YG, JYP and KeyEast and other famous Korean agencies participated in the Talent Meeting in Busan, with noteworthy outcomes including an agreement with the Huayi Brothers, the biggest film company in China. 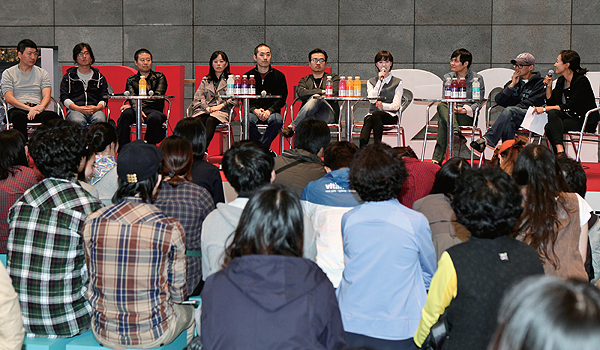 Project pitching sessions hosted by Korean Producers in Focus (KPIF) and the Korea Creative Content Agency (KOCCA) were exceptionally popular this year. Of the five competitors, producer Kim Jung Young won for his project “Mystery of Hotel Prison” (working title). The film takes place 32 days before the national college entrance exam, and explores the tensions between teachers and professors locked away in hotel to prepare the exam questions when a murder occurs. Finishing the four-day event on the 13th will be the Film Fund Talk seminar, the Asia Cinema Fund Choice Award and the Asia Project Market Awards. Among these, the Asia Project Market Awards sparked the most interest. Prizes included the Busan Award ($20,000) sponsored by Busan Metropolitan City, the Kodak Award (20,000,000 won worth of negative film), the CJ Entertainment Award ($10,000) and the LOTTE Award (10,000,000 won).